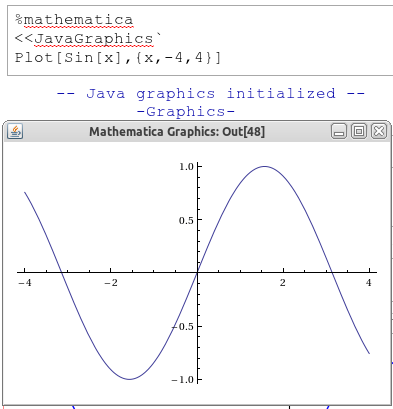 Is there an easy way to get Mathematica graphics into a sage notebook? There's three work-arounds I can currently think of. but this puts the graphics object in a separate window (not in the sage notebook). Extract the graphics data and feed it into a sage plotting function, e.g. which does what I want, but is a little cumbersome - especially for more complicated graphics. Actually, following kcrisman's hint and looking at the sage-notebook thread, it turns out that it's already implemented and so really easy! Show a mathematica expression or plot in the Sage notebook. that does exactly what I wanted. But will they show up without the "show"? Anyway, glad you are happy :) But it would be nice for it to work in the %mathematica mode as well. Can you either make a new answer with *exactly* what commands don't work for you, or a new question which references this question? Thanks! @kcrisman, I'll ask another question first thing tomorrow. Thank you for your interest. You may want to look at how this is implemented for R or other external programs. See this thread for this. You may need to implement several commands in the Mma interface, a chdir or something else; it's different for each program. Short version: essentially, you need to make sure the output of the program (the graphic file itself) ends up in the correct directory for the cell in the notebook. Good luck! Thanks kcrisman - the thread you linked to shows that what I want is already implemented! See my answer. I'm not sure this is really relevant, and I don't have any experience with Mathematica worth mentioning, but I just want to address part (1) of your question, about importing images to SAGE. If you use the Notebook interface to sage (in stead of a command shell) it's actually quite simple: open the [Data] dropdown menu above the worksheet and upload an image file to your worksheet. You can then insert the image in a text cell, as an html image. Sorry if I'm only stating the obvious. It is relevant and useful. I knew how to add images into a text/html cell, but I had never used the data menu before. Thanks!